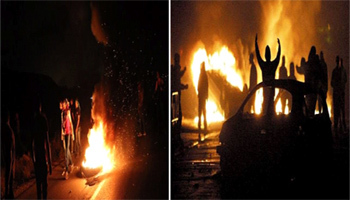 Tunisia, Tunis: football supporters clash with cops (no confrontations with fans of opposing team reported) Video here. Given that exactly a month before, on 15th January, over 1000 of the same team supporters “gathered Monday evening in the working class Bab Souika neighborhood of Tunis. Chibani said the crowd attacked a government building with stones and bottles, before police fired back with tear gas.” ( see below ), I imagine that these fans had a clear anti-cop, anti-state hatred that motivated them far more than football. 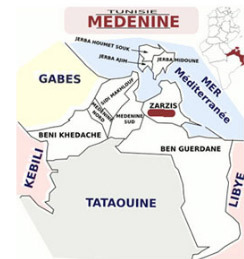 Tunisia, Feriana: more clashes and roads blocked…similarly in Tunis (Ettadhamen…and Kram) More here, which mentions “Sidi Ali Ben Aoun (Sidi Bouzid)… Ettadhamen city (Ariana) and Douar Hicher ( Manouba) where, according to Interior Ministry spokesman Khalifa Chibani, young insurgents have erected barricades across the streets and clashed with the lackeys of power. 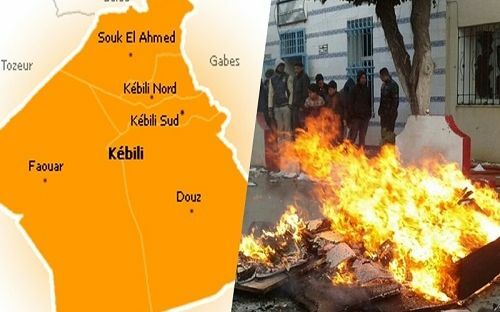 In Nabeul, the cops reported 26 arrests, 11 of which were directly related to clashes with the police and various looting of shops, customs depots and state buildings. 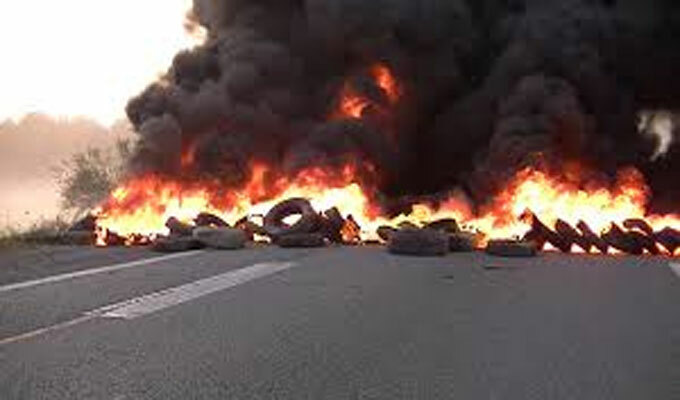 During the night of Sunday to Monday, there were anonymous burning tires in several streets and stones thrown at the police. In Sidi Ali Ben Aoun, others tried to break into a warehouse owned by Tunisian Customs, only just prevented by the cops. In Sidi Bouzid, a group of insurgents damaged a high voltage power cable, causing a power cut in some areas”…and more here in English…Longish reformist article here “Tebourba is a prison” said Oussema Ellafi, an unemployed 32-year-old …”If you have connections, you work. Those who are deserving, don’t work. You go to the [local government] office and ask them to find you work and they say there’s only farm work. What’s this farm work? They’re making fun of us, giving us a [sedative] pill… Just be hungry and shut up.”…in Tebourba, and in poor towns and areas across the country, there’s a different, more desperate and raw anger….Without organised leadership and structure, the opposition protests will likely remain volatile.” I’d guess that implicit in this is the desire on the part of certain sections to offer themselves to the state as some future “organised leadership and structure” to prevent these movements from becoming volatile, possibly organisations such as Manich Msamah (‘I Will Not Forgive’) or the Fech Nestannew (‘What are we waiting for?’) campaigns. The miserable history of all the organisations which aim to tame social explosions is that they start off as benign reformists subservient to a modification of dominant “realism” and end up as part of the ruling racket. 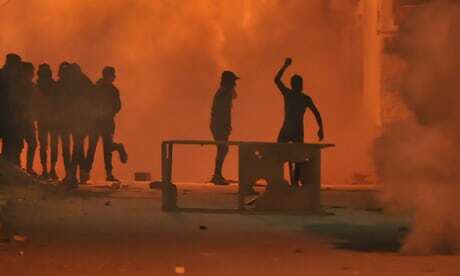 Tunisia, Tunis: stall-holders clash with cops after state cracks down on “anarchic” street markets proliferating since uprising of 2011 For an ultra-leftist take on the situation there, see this analysis. Very interesting to contrast this timeline of proletarian revolution/rebellion with the bourgeois notion of revolution (the replacement of Ben Ali). I tried to contact you yesterday to your previous email address (email address) but it didn’t run. It’s a long time ago we have no news anymore from you. How are you? Did you receive the last issue of “Communism” last summer? What do you think about? Since weeks the proletariat in the Maghreb is in open rebellion. And now it spreads to Egypt as well… We support all the insurgents struggling against the increase of the rate of exploitation, and against exploitation as such. Here I send you an interesting “Leaflet of solidarity with the Tunisian insurgents” signed by a French group called “Autonomous struggles”, and we translated in English (see Attach Files). Moreover we also published our own leaflet in French and in English. Now the problem is that we see the needs to translate these materials in Arabic (of course!! !…), but we are a little bit lost. We could find some solution, but we prefer to contact you first. Could you help us in this ask? BTW don’t hesitate to use both materials for your intervention and propaganda. Don’t hesitate to send us any interesting material you could obtain. Don’t hesitate to send us information about what is happening now… We are reading some posts and discussion about Egypt on “Libcom.org”. Class solidarity with the insurgents in the Maghreb , in Egypt … and all over the world! 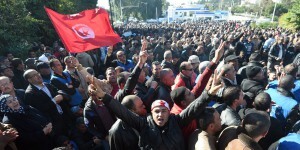 Modern proletarians in present day Tunisia have risen in revolt against the worst excesses and exactions of the bourgeoisie and have caused the bourgeois puppet master to flee temporarily. The time is not now, however, to topple the whole capitalist edifice. The working class knows that it must impose its dictatorship for one thousand years and more. Once again having formed the historical vanguard, the proletariat dissolves itself into civil society and allows the petty bourgeoisie to take up the reigns of political power. 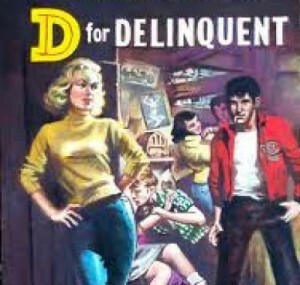 ALL POWER TO THE POWERLESS!